Those who spoke in opposition said the proposed land use was incompatible with the nearby residential neighborhoods. The negative recommendation will be before to the Board of Commissioners on Dec. 6, along with a positive recommendation to allow Briarwood Baptist Church at Robinhood Road and Hog Mountain Road to build a new 12,000-square-foot worship Center. The Planning Commission also sent to the Bogart City Council a positive recommendation for rezone of 28 acres on Atlanta Highway inside the city to create a residential subdivision. The Planning Commission postponed action on a request for a rezone of land for another residential subdivision on undeveloped land to the west of Daniells Plantation subdivision. The Mr. Chick Farms Limited Partnership of Gainesville and Eleanor Prather of Good Hope, in Walton County, are asking the county to grant a special use to allow for development of the solar farm on two parcels at the intersection of McNutt Creek Road and Dials Mill Road. 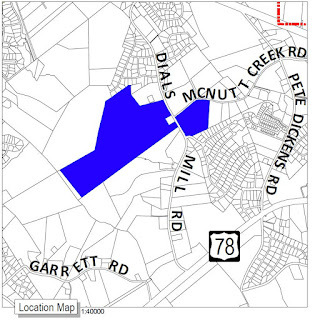 The larger parcel, owned by Mr. Chick Farms, is 199 acres and runs from Dials Mill Road to Barber Creek. The parcel owned by Prather is just less than 34 acres and is at the southeast corner of the intersection of McNutt Creek Road with Dials Mill Road. Rural Green Power LLC, with an Athens postal address, is to be the developer of the $50 million project, according to the rezone narrative. The total build-out of the project should be completed between June and August of 2018, according to the narrative. The properties currently are pasture land with trees along tributaries to Barber Creek. The concept plans submitted with the rezone request show much of the acreage covered with solar panels. The outsides of the properties would be buffered with vegetation, according to the plans submitted. The Oconee County Planning staff noted in its review that the “request is inconsistent with the development goals and strategies of the Suburban Living character area” of which it is a part. The staff recommended approval of the special use request. Nine citizens spoke in opposition to the solar farm at the hearing last night. A 10th gave a mixed recommendation. When asked by Planning Commission Chairman Dan Arnold, at least three persons stood to express approval. Several of the opponents came from Belfair subdivision, which abuts the Prather Property. Abe Abouhamdan, who heads the county’s Land Use And Transportation Planning Committee, spoke against the project on behalf of the developers of Wildflower Meadows, a nearby subdivision under construction. The Planning Commission voted 5 to 0 in favor of the negative recommendation regarding the project. Two members abstained. I did not attend the Planning Commission meeting. Sarah Bell did attend and video recorded the session. The complete video is below. The audience spilled out of the Commission Chamber into the hallway as the hearing took place. OCO: Planning Commission Meeting 11 14 2016 from Lee Becker on Vimeo. Melvin Davis and Abe Abouhamdan, THIS HAS TO STOP! It is beyond unethical for a person to chair the Oconee County Land Use And Transportation Planning Committee, and then turn around and do business with the county representing residential developers!!?? Is this even legal? It's time for the Georgia Attorney General to look at this and all of the various conflicts of interest that typify the Melvin Davis administration: Rick Waller of the IDA who does business with the county, State Transportation Board member Jamie Boswell who involves himself with county transportation projects that affect his clients, Abe and his various dealings with the county, the county's Economic Development Director presenting a report written by an auto dealership manager, etc., etc. etc. The above post is spot on correct. That Abe Abouhamdan is chair of Land Use and Transportation is ludicrous. Abe at least recognized this time the incompatibility issue, but...next time? no matter what amount of vegetation the plans call for. Plans sure have a way of being forgotten as the profits roll in. Oconee County taxpayers will find out quickly the tone of the John Daniell administration. We should expect him to immediately name a new chair of the Oconee County Land Use and Transportation Planning Committee. The new chair should have no conflicts of interest to hold the position. If John Daniell keeps on Abe Abouhamdan, we can expect a continuation of the Melvin Davis days of "a who you know gets you ahead Oconee". Wonder what would have happened if the three out of county parties making the request (Rural Green Power of Athens, Mr. Chick Farms of Gainesville, and Ms. Eleanor Prather of Walton County) hired Abe Abouhamdan to represent them in front of the Oconee County Planning Commission??? Yes, they sure should have hired Abe. A solar farm versus more subdivisions. The subdivisions are a problem for the schools, will increase needs for roads, police, fire, parks, etc, leading to increased county costs. The solar farm will generate electricity without pollution. A solar farm is quiet, requires few services, generates little pollution. I would definitely go with the solar farm. We have solar panels. No problem living with them. I think these residents are being short sited. A solar farm screened off would be a much better, quieter neighbor than more people. You might want to do some research before jumping on the "green" bandwagon. What little electricity that it provides will go outside the county. You have over 200,000 solar panels running right up against 2 subdivisions and near 10 other ones. No employees, no increase in property taxes and only a couple of years of drastically reduced personal property taxes. The "green" winners of the project are a group of Atlanta investors! @Zippity...apparently you are not following close enough or not paying attenetion. THIS solar power "farm" which would be residing in Oconee Co will be providing ZERO power to Oconee Co but rather to Barrow and Hall Counties. So then I ask anyone supporting this----why?